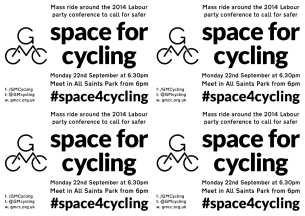 GMCC want as many people as possible to ride with us on our Space for Cycling ride around the 2014 Labour Party conference, on Monday 22nd September. 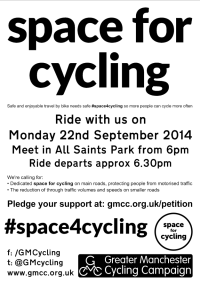 Assemble in All Saints Park from 6pm. 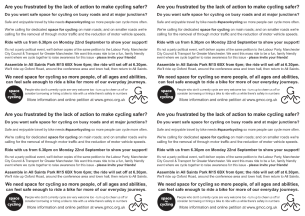 There are flyers and posters to download below – please spread the word and invite everyone you know! We wont leave before 6.30pm so do join us even if you can’t arrive at 6pm prompt. 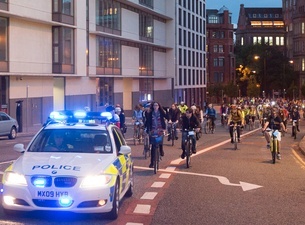 As with last year’s party conference ride, we will have support from Greater Manchester Police to ensure we can remain in one group, keeping the ride safe and free from private motor vehicles. 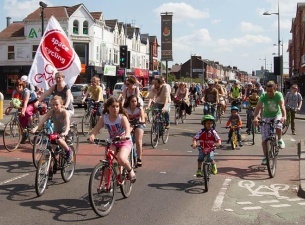 We’ll have a Dr Bike available from 6pm if your bike needs any minor adjustments before the ride and we’ll have traffic police support, two bike mechanics and a trained first-aider on hand during the ride. 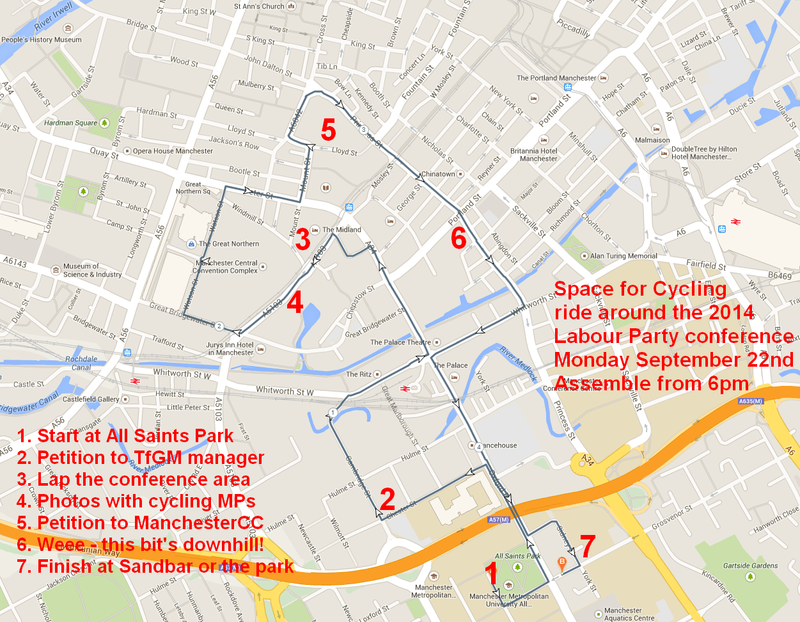 The ride will follow the route below, returning to All Saints Park (M15 6BX). 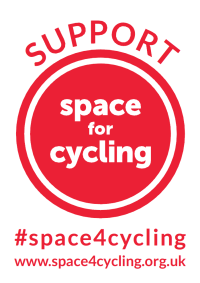 We should be finished by 8pm but it will be dark by then so remember to bring your lights. 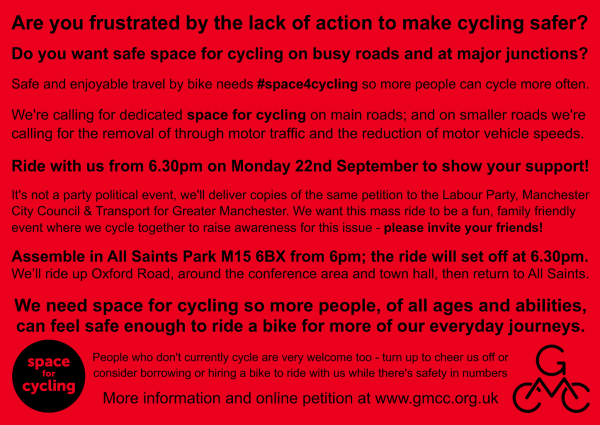 We’ll deliver copies of the petition to a Labour MP, an MCC Councillor and a TfGM Manager. 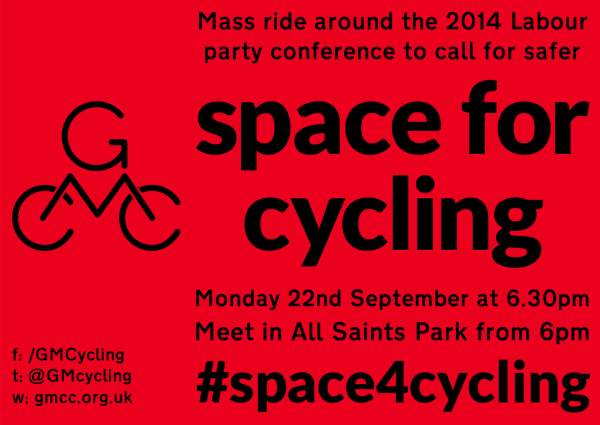 There’s also a facebook page for the GMCC Labour conference #space4cycling ride Mon 22nd Sept 2014. Click to view the route map as a larger image or as a full screen map in a new window.